Climate change is an important area of board oversight, encompassing potential long-term physical impacts on operations, risks and opportunities, as well as the potential for rapid acceleration of change and crisis. Increased water scarcity, rising sea levels and changes to vegetation from rising temperatures, as well as potential extreme weather events, are impacts of climate change which need to be considered and planned for. These may involve risks of damage or disruption to operations or lack of access to key resources; which management needs to manage under the board’s oversight. They also may provide a competitive advantage to organizations which are better protected from such impacts and may present an opportunity for organizations engaged in safety, repair and reclamation activities. Organizations are encouraged to consider, and report on, a 2°C scenario – i.e. where the global average temperature increases 2°C above pre-industrial levels. Although the pace of regulatory change on climate change in the U.S. under the current administration has slowed, the trend toward a less-carbon intensive environment is still expected to continue through changes which reduce energy consumption and increase availability of renewable energy alternatives. 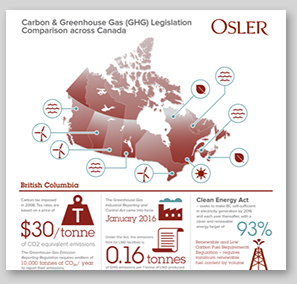 Canadian federal and provincial governments have established key targets to reduce emissions and adopted emissions legislation which impact business operations and asset values, especially extractive industries. In response to environmental concerns expressed by consumers, affected communities, and environmental activists, organizations provided voluntary disclosure regarding their initiatives to address environmental concerns including climate change. Such disclosure has typically been provided outside of the organization’s annual report, proxy circular and other mandated continuous disclosure documents. Investor interest in environmental impacts on publicly traded entities prompted the SEC to issue climate change disclosure guidance in February 2010 and the CSA to issue environmental reporting guidance in October 2010. In March 2014 the Toronto Stock Exchange and the Chartered Professional Accountants of Canada issued a primer on environmental and social disclosure to help TSX listed entities respond to increasing pressure for disclosure of such information. But investor interest in climate change continues to increase, and institutional investors are dissatisfied with the quality of the disclosure provided. BlackRock issued a report in September 2016 stating its view that climate factors have been underappreciated and underpriced by organizations – which the authors attribute to the fact that the effects of climate change are relatively less visible and more longer distant than other, near-term risks. Shareholder proposals focussed on climate change and the environment, especially on reporting on such matters, have accounted for 8% of shareholder proposals annually in Canada over the last 10 years. Often the shareholder proposal is withdrawn when the organization commits to addressing the request, but when submitted to a vote, the level of shareholder support received can be significant. And it appears that in the U.S. both the number of proposals and the level of support they receive is increasing. Such trends are expected to continue in part because activist organizations are highlighting institutional investors which support such shareholder proposals and are threatening to apply pressure to those which do not. In its report and recommendations issued in December 2016, the Financial Stability Board Task Force on Climate-Related Financial Disclosures (Task Force) recommends disclosure be provided regarding the organization’s governance around climate-related risks and opportunities, actual and potential impacts of these on the organization’s businesses, strategy and financial planning, how the organization identifies, assesses and manages climate-related risks and the metrics and targets used to assess and manage climate-related risks and opportunities. The Task Force also recommends these disclosures be provided in organizations’ mainstream financial filings. In response to the Task Force, and to the publication of recommendations for market-wide adoption of environmental, social and governance integration in Canada by Principles of Responsible Investment, the United Nations Environment Programme – Finance Initiative and The Generation Foundation, the Canadian Securities Administrators launched in March 2017 a new climate change disclosure review project involving a review of domestic disclosure practices and international disclosure standards and receipt of investor feedback. Proposals to include expanded disclosure regarding climate change in mandated organization filings under securities laws will subject public entities making such disclosure, and their boards, to potential liability under securities laws in the event of a misrepresentation. However, voluntary environmental disclosure has already led to litigation in the U.S., where plaintiffs have sought recompense when the organization’s practice has failed to meet the standard reflected in its voluntary disclosure. At annual meetings, shareholders are demanding that organizations explain how their business decisions align with their stated environmental goals and practices. Climate change involves long term business risks and opportunities which boards need to consider, but the pace of change from a regulatory and disclosure perspective is increasing. Board oversight of the strategic, risk and disclosure implications is a necessity with support from Corporate Governance advisors who can bring a knowledgeable and holistic legal perspective to the issue. Board oversight of the strategic, risk and disclosure implications is a necessity with support from advisors who can bring a knowledgeable and holistic legal perspective to the issue.